To recover the royal family. Archer- A card of the Diamonds suit. Autumn(or Logistics) - The first round of a turn (or Year of Conflict) in which 4 tricks are played to determine what cards are available to each player. 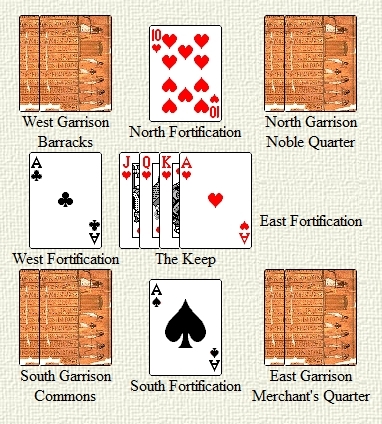 The West Quarter Garrison (or Barracks) - A pile of face-down cards of the Clubs suit. The North Fortification (or Noble Fortification) - One face-up card of the Hearts suit. The North Quarter Garrison (or Noble Quarter) - A pile of face-down cards of the Hearts suit. The West Fortification (or Barrack's Fortification) - One face-up card of the Clubs suit. The Keep - A Jack face-up, plus any members of the Royal Family also face-up. The East Fortification (or Merchant's Fortication) - One face-up card of the Diamonds suit. The South Quarter Garrison (or Commons) - A pile of face-down cards of the Spades suit. The South Fortification (or Commons Fortification) - One face-up card of the Spades suit. The East Quarter Garrison (or Mechant's Quarter) - A pile of face-down cards of the Diamonds suit. Field- The player's hand of 5 cards. Fortification - Any card from a 2 through to an Ace (but not a Joker) when placed as one of the 4 defences for a city. Garrison- A pile of up to 2 face-down cards, all of the same suit used to defend or attack a city. Initiator of Conflict- The player who goes first. Keep- A Jack when placed in the setup portion of the game. This card is never used in play except to determine the Royal Family Line. Non-Keep Jacks are used as normal. Knight- A card of the Hearts suit. Mercenaries- A Joker. This card may never be kept in a Garrison, or used as a Fortification. It may only be used in Autumn as part of a Trick, or as part of an attack in Summer. Peasant- A card of the Spades suit. Royal Family- The Lord Marshal, the King and the Queen of the correct Lineage. No player may have more than one of each (in the case of 3 or 4 player games). Royal Family Line- One of the 4 suits as represented by The Keep. Note that in a 3 or 4 player game, two players may have the same suit. Sapper- A 2 when used against a Fortification. This card will defeat any Fortification. Siege Tower- Any card from the 3 through to the Ace when used against a Fortification. This card will only defeat Fortification cards of lower rank. Soldier- A card of the Clubs suit. Spring(or Campaigning) - The third round of a turn (or Year of Conflict) in which players attack other player's cities. Suits- There are 4 suits in the game. Suits are used to represent a particular area of the city, and when playing the first card in a trick - other players must follow suit (play the same suit if possible). However, no suit is higher ranked than another suit when determining the highest card. Summer(or Reinforcements) - The fourth and last round of a turn (or Year of Conflict) in which players move all cards from the Field to their cities that they wish to and discard the remainder (Mercenaries must be discarded). Each player then receives new cards. Trick- A card played by each player during Autumn. The highest card wins. The winner of a Trick puts the cards won to one side of their city to be used later. Winter(or Winter Quarters) - The second round of a turn (or Year of Conflict) in which the players redistribute cards amoungst their city and their hand (or the Field), except for any Mercenaries which must stay in the Field. Year of Conflict- One complete turn of the game, which consists of 4 rounds, Autumn, Winter, Spring, Summer. Joker, Ace, King, Queen, Jack, 10-2 (highest to lowest). In the case of two cards of the same rank, the first played card wins. 5-6 Players require 3 decks. 1 joker card per player. Remove Jacks from deck(s). Deal 1 Jack to each player, this represents their family line, and the royal family they must collect. The remaining Jacks are returned to the deck and used as normal cards. Each player places the Jack (representing the family's Keep and Royal Family Line) in front of them. Deal 5 cards to each player. Starting on the dealers left, each player places one card of a different suit to the left,right,top or bottom of the Jack. This represents the fortifications around the different parts of their city. If a player does not have a particular suit, then that part of their city is undefended. The higher the card, the better. North (furthest from player) is Hearts, East is Diamonds, South Spades and West is Clubs. Each player is then given enough cards to replace those used as fortifications and bring their hand back up to 5 cards. The player with the fewest fortifications is the Intiator of Conflict and starts the play for the first season (Autumn). In the case of a draw, the players count from (but not including) the dealer in a clockwise direction, the first player with the equal fewest fortifications encountered is regarded as the Initiator of Conflict. During Autumn 4 tricks are played. of the initial suit wins. Mercenaries count as the highest card of every suit. The winner of a trick plays the first card for the next trick. next year, otherwise it goes to the winner of the final trick. Tricks become part of the player's hand at the end of Autumn. Starting with the Initator and proceeding clockwise, each player may redistrubute cards from their hands, the tricks they have won and the city, how they like except for the following conditions : Fortifications may only contain one card of the correct suit (i.e. North Fortifications must be a Hearts card). Garrisons may only contain a maximum of 2 cards of the correct suit. Only members of the Royal Family may be placed in the Keep. Only 5 cards may be kept in the Field (hand). Mercenaries may not be placed in the city but must be kept in the Field. The Keep and all card in it are displayed face-up at all times so as to be easily read. Likewise the Fortifications. Garrisons are always kept face-down and other players may only count the number of cards in a Garrison and may not look at the cards. All discards are placed in a pile face down and will be reshuffled into the pack at the end of the Year of Conflict. During Spring any player may attack any other player. Starting with the Initiator of Conflict and proceeding clockwise, a player declares who the are attacking and which part of their city they are attacking. To attack a quarter of the city, the attacker needs cards of the same suit. The attacker takes cards from the garrison appropriate and uses the cards in their hand as well. Step 1 - Overcome fortifications. Attacker takes cards from one of their garrisons and places them in their hand (in the Field). Defender takes cards in defending garrison and places them in their hand. Attacker plays siege tower (3-joker) or sapper (2) to overcome fortifications. A Sapper will beat any fortification, otherwise a Siege Tower must be of higher value than the fortification. If successful, Attacker continues attack, otherwise the Attacker discards the card and may not attack that player again this turn. If a Mercenary or a Sapper where played to defeat the fortification, then the fortification card will be captured by the attacker at the end of the attack. Step 2 - Fighting in the streets. Defender plays one card from either their hand or from the Keep. Highest rank card wins (ignore suit). In the case of a draw, the first card played wins (ie the Defender wins draws). If at any stage the Defender plays a card that can not be beaten by the Attacker, the Attacker is repulsed. If the Attacker succesfully defeats all the Defenders cards, the Defender's cards are captured by the Attacker, including the fortification. The Attacker discards their own cards used in the attack (i.e. those placed on the table to attack the Defender's card). If the Attacker is repulsed, the Attacker discards all cards used in the attack, the Defender keeps their own cards, placing them back in their original positions. Step 3 - Siege and Capture. Using the Royal Family - The Defender may chose not to use the royal family (they can be used no matter which suit attacks), and may leave them in the Keep. If the Attacker wins their attack, they may capture one of the Royal Family if they play a Mercenary card not previously used in the attack. They capture the card of their choice from the Keep. If the Attacker played a Sapper or a Mercenary to defeat the defender's fortificaions, then the Attacker may capture the fortification card. Captured cards may not be used until Summer. During Summer, each player receives new cards. Starting with the Initiator and proceeding clockwise, each player may place cards from the field into their city, in a garrison, keep or fortification (following the same restrictions as Winter Quarters). No cards may be moved to the players hand, only from. Mercenaries must be kept in the player's hand, and are therefore discarded..
After all cards in hands have been placed, the rest of their hand is discarded and they receive 5 new cards for the next Year. All discards are then reshuffled into the deck of cards. Play continues until one player has all of their Royal Family in their Keep. While tempting to use the royal family as often as possible in defence - if they aren't used, they can't be captured unless the attacker plays a joker. Having high value cards in the field allows them to be used for attacking or defending from any direction - but you will lose them at the end of the year.&nbsp; It is always a good idea to increase the size of your garrison and fortification where possible. Placing a royal family member of another player in a fortification is just asking for trouble.&nbsp; So make sure you have enough mercenaries.